Forget latex and rubber. RockBand Flex is your all-in-one rehabilitation, stretch and mobility solution. Available in three resistances, RockBand Flex unlocks a universe of movement improvement and is designed to be washable, portable and infinitely reusable. Get more flexible, improve range of motion, rehabilitate injuries and improve your strength with the ultimate all-in-one band. Made from a proprietary cotton-nylon blend, with 6-inch loops spaced equally on each half of the band, Flex allows an athlete to use one tool to rehabilitate injuries, improve mobility and increase strength. What can you do with RockBand Flex? Blood? Sweat? Tears? RockBand Flex can be easily washed to keep it from getting too stinky & grimy. Remember to hang dry! RockBand Flex is packable and lightweight – throw it in your suitcase to pump up those hotel-gym workouts while you’re on the road. 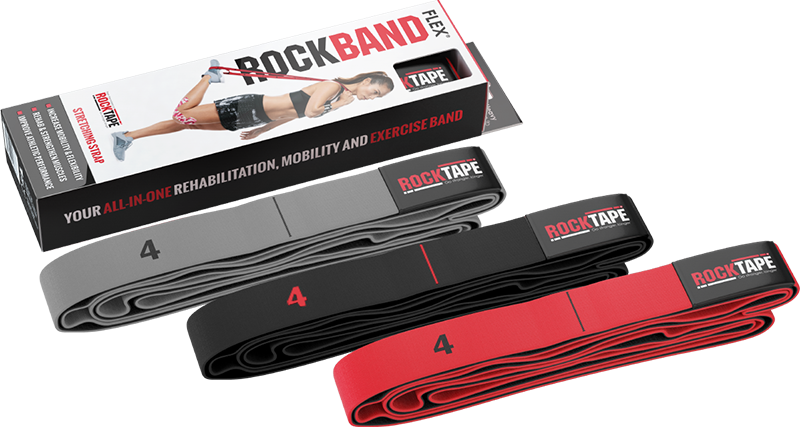 RockBand Flex is made with a soft cotton-nylon blend, so it won’t bite back at you like standard elastic exercise bands do.